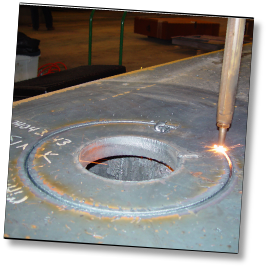 The TB-30 Torch Booster is the right torch booster for a fabricators with a single brazing or cutting torch.The system supplies 40 cubic feet of natural gas per hour at 25 psi. Many TB-30 users also purchase a regulator to set gas pressure between 1-25 psi. The system includes a 1/2” shutoff valve and 5’ flexible hose for easy connection to the utility natural gas pipe. Complete TB-30 System description is here. One-year / 2,000 hour parts and labor warranty. Shipping from Buffalo, NY is an additional charge. Sales tax is charged for deliveries in New York State. Call G-TEC at 1-800-451-8294 if you are located in NYC. Standard TB-30 Torch Booster pressure is 25 psi so to set pressure between 1-24 psi you will need a regulator. Our regulators screw right onto the front of the Torch Booster and make it easy to set the exact pressure you want. to order your TB-30 Torch Booster! Read our standard sales terms and conditions. Read our 1-year/2,000 hour Warranty. The TB-60 Torch Booster is the right Torch Booster for a fabricator using 1 or 2 brazing or cutting torches. The TB-60 system supplies 60 cubic feet of natural gas per hour at 25 psi. Many TB-60 users also purchase a regulator to set gas pressure between 1-25 psi. The system includes a 1/2” shutoff valve and 5’ flexible hose for easy connection to the utility natural gas pipe. Complete TB-60 system description is here. One-year/2,000 hour parts and labor warranty. Shipping from Buffalo, NY is an additional charge. Sales tax is charged for deliveries in New York State. This system cannot be directly purchased for installation in New York City - call G-TEC at 1-800-451-8294 if you are located in NYC. 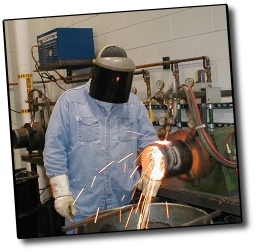 The TB-125 Torch Booster is the right Torch Booster for a fabricator using 3 or 4 brazing or cutting torches. The TB-125 system supplies 150 cubic feet of natural gas per hour at 25 psi. Many TB-125 users also purchase a regulator to set gas pressure between 1-25 psi. The system includes a 3/4” shutoff valve and 5’ flexible hose for easy connection to the utility natural gas pipe. Complete TB-125 system description is here. The TB-250 Torch Booster is the right Torch Booster for a fabricator using up to 6 brazing or cutting torches. 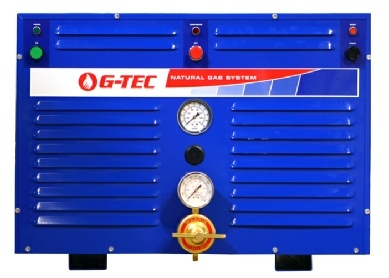 The TB-250 system supplies 300 cubic feet of natural gas per hour at 45 psi. 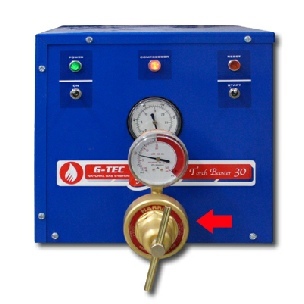 Many TB-250 users also purchase a regulator to set gas pressure between 1-45 psi. The system includes a 3/4” shutoff valve for easy connection to the utility natural gas pipe. Complete TB-250 system description is here. The TB-500 Torch Booster is the right Torch Booster for a fabricator using up to 6 brazing or cutting torches. 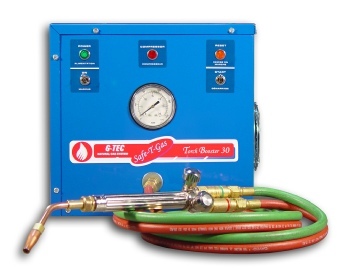 The TB-500 system supplies 550 cubic feet of natural gas per hour at 45 psi. Many TB-500 users also purchase a regulator to set gas pressure between 1-45 psi. The system includes a 3/4” shutoff valve for easy connection to the utility natural gas pipe. A complete TB-500 system description is here. to order your Heavy Duty Torch Booster! 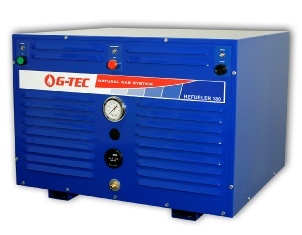 Refueler 60 is the right G-TEC Pressure Booster for filling 1 to 4 cylinders in a small to medium sized facility. Refueler 60 fills cylinders at an average rate of 60 cf/hr so NG-130 cylinders fill in a little more than 2 hours. Filling is automatic once the system is started; Refueler 60 turns itself off when the cylinders are full. A complete Refueler 60 system description is here. 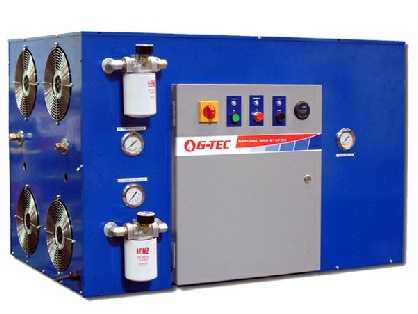 This system cannot be purchased for installation in New York City - call G-TEC at 1-800-451-8294 if you are located in NYC. Use your Discover, VISA, MasterCard or American Express card to purchase your Refueler 60. New York State sales tax, if applicable, and shipping are an additional cost. Refueler 180 is the right G-TEC Pressure Booster for filling 4 or more cylinders in a medium to large sized facility. Refueler 180 fills cylinders at an average rate of 180 cf/hr so NG-14 cylinders fill in about 5 minutes, NG-45 cylinders fill in about 15 minutes and NG-130 cylinders fill in about45 hours. Filling is automatic once the system is started; Refueler 180 turns itself off when the cylinders are full. A complete Refueler 180 system description is here. One-year/2,000 hour parts and labor warranty. Shipping from Buffalo, NY is an additional charge. Sales tax is charged for deliveries in New York State. This system cannot be purchased for installation in New York City - call G-TEC at 1-800-451-8294 if you are located in NYC. Use your Discover, VISA, MasterCard or American Express card to purchase your Refueler 180. New York State sales tax, if applicable, and shipping are an additional cost. G-TEC Adsorbed Natural Gas Cylinders use a patented carbon storage medium to hold 130 cubic feet of natural gas at only 275 psi. G-TEC cylinders have a CGA 510 valve. 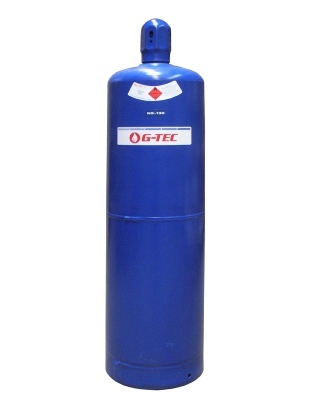 A complete Natural Gas Cylinder product description is here. One-year parts and labor warranty. Shipping from Buffalo, NY is an additional charge. Sales tax is charged for deliveries in New York State. G-TEC cylinders cannot be purchased for installation in New York City - call G-TEC at 1-800-451-8294 if you are located in NYC. Use your Discover, VISA, MasterCard or American Express card. New York State sales tax, if applicable, and shipping are an additional cost. 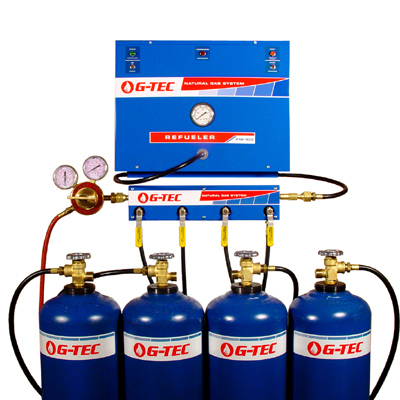 A G-TEC Manifold allows four cylinders to be filled simultaneously. A Simple Tee connects the Refueler to a single cylinder and torch to allow high gas flows for brief periods. The Refueler automatically refills the cylinder as gas is used. The DM-60 Torch Booster / Refueler can fill cylinders and supply high-pressure natural gas directly to torches (although not both at the same time). 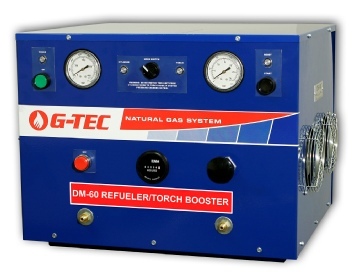 As a Refueler DM-60 works like a Refueler 60 and fills G-TEC cylinders to 275 psi at a rate of 60 cf/hr. As a Torch Booster DM-60 features a built-in regulator to adjust pressure between 1-25 psi and supplies up to 60 cf/hr, enough for two typical brazing or cutting torches. The system includes a 3/4” shutoff valve for easy connection to the utility natural gas pipe. A complete DM-60 system description is here. Use your Discover, VISA, MasterCard or American Express card to purchase your DM-60. TB-125C, TB-250C and TB-500C Torch Boosters are for applications that use natural gas at 45 - 60 psi, are in places where temperature exceeds 90F, where the Torch Booster operates around the clock 5 or 7 days a week and where downtime becomes costly in a few minutes. TB-250H Torch Boosters are for applications that require natural gas pressure between 60 psi to 150 psi regardless of duty cycle. Both “C” and “H” Torch Boosters feature an adjunct Oil Cooler Module to keep the compressors cool, extending system lifespan and improving application performance. A complete description of Heavy Duty Torch Boosters is here. Standard TB-60 Torch Booster pressure is 25 psi so to set pressure between 1-24 psi you will need a regulator. Our regulators screw right onto the front of the Torch Booster and make it easy to set the exact pressure you want. to order your TB-60 Torch Booster! Standard TB-125 Torch Booster pressure is 25 psi so to set pressure between 1-24 psi you will need a regulator. Our regulators screw right onto the front of the Torch Booster and make it easy to set the exact pressure you want. to order your TB-125 Torch Booster! Standard TB-125 Torch Booster pressure is 45 psi so to set pressure between 1-44 psi you will need a regulator. Our regulators screw right onto the front of the Torch Booster and make it easy to set the exact pressure you want. to order your TB-250 Torch Booster! Standard TB-500 Torch Booster pressure is 45 psi so to set pressure between 1-44 psi you will need a regulator. Our regulators screw right onto the front of the Torch Booster and make it easy to set the exact pressure you want. to order your TB-500 Torch Booster! Our regulators screw right onto the front of the Torch Booster and make it easy to set the exact pressure you need. Model 2548-200 regulator lets you set pressure up to a system maximum 150 psi. 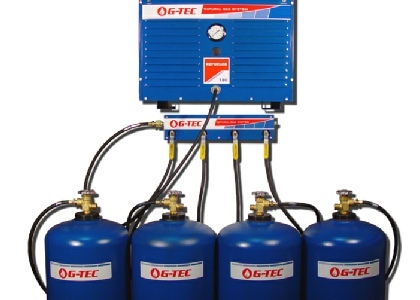 A G-TEC Manifold lets you fill more than one cylinder at a time; they are sized for four cylinders and where local codes permit can be daisy-chained to fill more than four cylinders. FD-4 Fill Manifolds are for filling cylinders that will be removed and used elsewhere and include a check valve at the hose connection to the manifold. CO-4 Continuous Operation Manifolds are for applications where the cylinders remain permanently attached to the manifold and Refueler to act as a gas reserve for situations that require high gas flow for limited time periods. Gas flows out of the cylinders during high demand usage and into the cylinders when the Refueler is automatically refilling the cylinders during downtime. Simple Tee Manifold is for applications where a single cylinder is used as a reserve supply for brief high gas demand requirements. Gas is supplied from the cylinder as needed then the cylinder is automatically refilled by the Refueler during downtime. Prices vary around the world - e-mail G-TEC or call 1-800-451-8294 and we will prepare a Quotation promptly! Use your Discover, VISA, MasterCard or American Express card to purchase your Single Cylinder Never MT System. New York State sales tax for units delivered in New York and shipping are an additional cost. require only a single torch but at times more gas flow is required and the Never M-T cylinder has a ready supply. The NG-130 Adsorbed Natural Gas cylinders holds 130 cf of natural gas at 275 psi when fully charged and gas flow capacity is unlimited up to the capacity of the cylinder. The system includes a 1/2” shutoff valve and 5’ flexible hose to connect the system to the utility gas pipe. The Multi-Cylinder Never M-T System is for glass lampworkers who have occasional need for very high gas flow to their torches for brief periods of time or where there are several lampworkers, such as in a commercial shop making scientific glassware. Options include either a Refueler 60 to refill cylinders at a rate of 1 cubic foot per minute or Refueler 180 which refills cylinders at a rate of 3 cubic feet per minute. From one to four NG-130 Adsorbed Natural Gas Cylinders can be connected to the Refueler depending on duration and gas flow volume of peak usage times. Each NG-130 cylinder holds 130 cubic feet of gas at 275 psi. 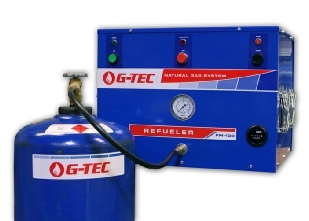 A G-TEC manifold connects up to four cylinders to the Refueler and a regulator allows exact pressure to be set for the downstream torches. Use your Discover, VISA, MasterCard or American Express card to purchase your Heavy Duty Torch Booster. to order your TB-HVOF Torch Booster! TB-HVOF Torch Booster is designed for High Velocity Oxy-Fuel thermal spray applications and boosts standard city gas pressure to 150 psi. Integral adjustable back flow check valve allows outlet pressure to be adjusted from 1-150 psi so a regulator is not needed. Utility gas supply pressure should be between ¼ to 5 psi but with 15 psi supply pressure TB-HVOF can fuel 2 HVOF spray units simultaneously. Complete TB-HVOF description is here.